Are you a lover of pure air, movement, sports and contact with nature? Well, here is the event for you? 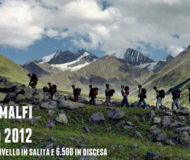 Trek Capri – Amalfi, a trip of five days, divided into six stages and guided by the expert and friendly guide Giovanni Visetti, will take place between 20 and 25 May 2012. A total of 136.2 km quenched the thirst for adventure of whom will decide to take part in the free event which will start from Sant’Agata, near Sorrento, on Sunday 20 May, reaching out to Amalfi, on Friday 25. In addition to keeping fit, taking part in the Trek Capri-Amalfi is also a way to discover an area characterized by unspoilt and beautiful sceneries, nestled amongst the local flora and fauna, which give evocative and charming moments.